GoAnywhere MFT stores detailed audit records for all file service activity and workflow processes that run in the product. You can quickly search this audit data through the browser-based administrator interface. Various audit reports can also be generated on a scheduled basis and distributed to the network or sent via email in PDF format. Authorized users can use the global search screen in GoAnywhere MFT to easily filter audit records by date and time ranges, user id and protocol. With a click of the mouse, each audit record can be drilled down into for more details. Each execution of a Project workflow is considered a "Job" and is assigned a unique job number for tracking purposes. Every Job generates an audit log, which is stored centrally in GoAnywhere MFT. Authorized users can quickly view the status of completed Jobs and their associated audit logs. Jobs can be searched by Project name, Job number, date range, user and completion status (e.g. Failed, Successful, Cancelled). The Job log results can be exported to a CSV file for use in Excel and other applications, and can additionally be sent to a central Syslog server for monitoring by operations personnel. 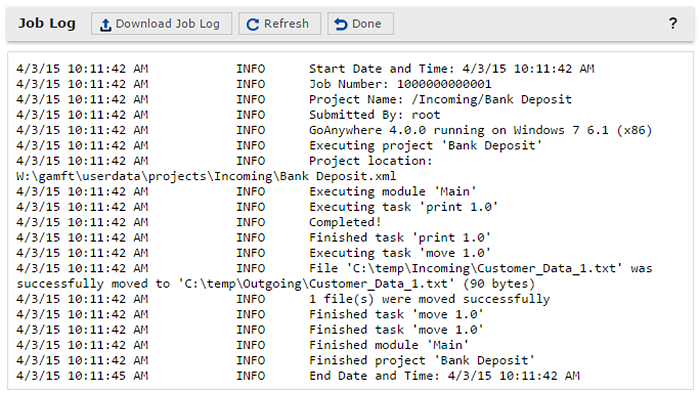 From the Completed Jobs screen, users can drill down into the log detail for each job. The amount of detail shown in each job log can be controlled by settings in its corresponding Project definition. Detailed audit log information is captured for all activity in the AS2, FTP, FTPS, HTTPS, and SFTP servers in GoAnywhere MFT. This includes login attempts, file uploads, downloads, errors and other events. 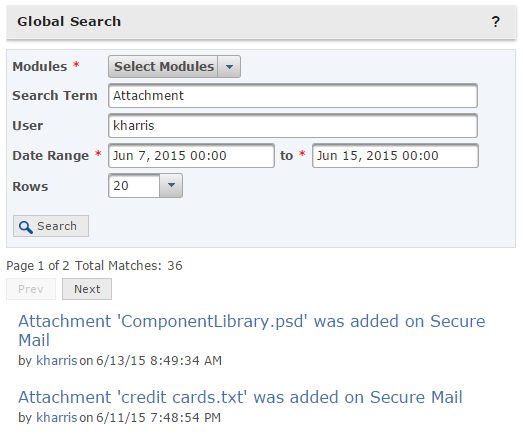 Through the browser-based interface, authorized users can quickly filter, sort and view the log detail. Audit log results can be exported to CSV file format, which can be shared with others or used in applications like Excel. Log messages can additionally be sent to a Syslog server to notify operations personnel of transfer activity, login issues and other errors. Users can drill-down into specific logs to see more information about the event. If the event fires a Trigger, this screen also indicates what triggers were executed, along with access to their corresponding trigger logs. 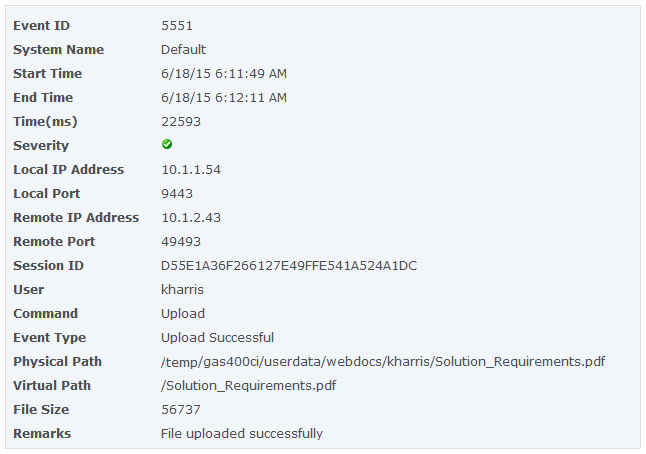 Changes to the GoAnywhere system made by administrators are captured to the Administration logs. These logs display the admin user account that made the change, what fields were changed, and the new values. Authorized users can search the logs for admin users, the components that were edited, and the actions that were taken.